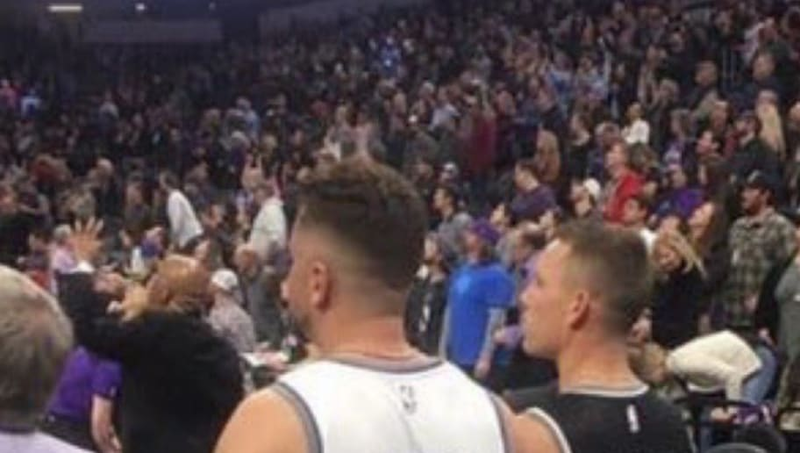 ​Two ​Sacramento Kings fans made a controversial political statement during Sunday night's 117-104 win over the Phoenix Suns. The fans were seen wearing custom jerseys, one saying "Build the Wall," and the other saying "Trump." It's pretty well documented that California is a blue state, so not surprisingly the two young men caught hell from local fans for their support of president Trump and his ideals, but I have a feeling they knew exactly what they were getting into. Yep. I'm like 15 rows behind these guys and wondered if I could hit em in the head with my shoe the whole game. Of course, every one is entitled to their own political beliefs and opinions, but this appears to be in bad taste. The sad thing is they did this to get this reaction. Nevertheless, the Kings were able to nab their 30th win of the season. Sacramento forward Marvin Bagley III made a statement to the team that passed on him by dropping a career-high 32 points to go with seven rebounds. Bagley was passed up on by his hometown team in favor of big man ​Deandre Ayton, after being born in Tempe, Arizona and playing a year at Hillcrest Prep in Phoenix (with Ayton). The No. 2 pick in the 2018 draft is averaging 13.3 points and 7.0 rebounds per game and has come alive of late after a bit of a slow start out of the gate. Kings fans are hoping these two young men can exhibit some of the same growth going forward that Bagley has this season. For now, though, Kings fans will also hope better jerseys are rocked in the stands.